A number of studies have reported on the effects of iron supplementation in low birth weight infants; however, no systematic review of the available evidence has been conducted to date. Hence, we performed a systematic review of the literature to examine the effects of iron supplementation on hematologic iron status, growth, neurodevelopment, and adverse effects in low birth weight/premature infants. We searched the Cochrane Library, Medline, and PubMed for articles reporting on the effects of iron supplementation in low weight infants. The following search terms were used: “preterm born infant(s)/children”; “preterm infants”; “prematurely born children” “weight less than 1500 g at birth”; “born prematurely”; “low birth weight infant(s)”; “infants born preterm”; “prematurity”; “small-for-gestational age”; “very small gestational age infants”; “iron supplementation”; “iron intake”; “iron supplements”; “ferric and/or ferrous compounds”; and “ferrous sulphate/fumarate/sulfate”. A total of 15 studies were identified and included in the systematic review. Supplemental iron was given orally or as an iron-fortified formula in 14/15 studies. The duration of treatment ranged from 1 week to 18 months. Iron supplementation significantly increased hematologic measures of iron status (including hemoglobin, hematocrit, serum ferritin) relative to placebo or over time in most studies. All controlled studies that examined iron-deficiency anemia (IDA)/ID reported a decreased prevalence of IDA/ID with iron supplementation. Dose dependent decreases in the prevalence of IDA/ID were reported in several studies. Of the 5 studies reporting on growth, none found any significant effect on growth-related parameters (length, height, weight, and head circumference). Only 2 studies reported on neurodevelopment; no marked effects were reported. There were no consistently reported adverse effects, including oxidative stress, inhibited nutrient absorption, morbidity, or the requirement for blood transfusion. The available data suggest that iron supplementation increases the levels of hematologic indicators of iron status and reduces the prevalence of IDA/ID in low birth weight/premature infants. There is insufficient evidence to make a definitive statement regarding the effects of iron supplementation on growth, neurodevelopment, or the occurrence of adverse effects in low birth weight/premature infants. Iron is an essential micronutrient that plays a critical role in many cellular functions and processes, including growth and development. As such, having an adequate supply of iron, along with other micronutrients, is thought to be particularly important for infants . Low birth weight infants, including premature infants, are especially susceptible to developing iron deficiency anemia (IDA) because these infants have smaller iron stores at birth and a greater iron requirement concurrent with a rapid increase in the red cell mass than term infants [2–5]. Increased hemolysis, shortened red blood cell lifespan, low circulating erythropoietin levels, blood sampling, and blood loss associated with medical and surgical procedures may all contribute to anemia in low birth weight and premature infants. The potential consequences of IDA during infancy include impaired development [6–11] and altered longer term neurodevelopment [12–14]. Due to the high risk of IDA, iron supplementation is recommended for low birth weight infants . Whether or not such supplementation is of any benefit to low birth weight infants is unclear. Interestingly, the findings from several systematic reviews / meta-analyses examining the effects of iron supplementation in children suggest that supplementation improves hematologic markers of iron status [16, 17], but does not markedly improve growth, or mental or motor development [18–20]. Although a number of studies have reported on the effects of iron supplementation in low birth weight infants, no systematic review of the available evidence has been conducted to date. 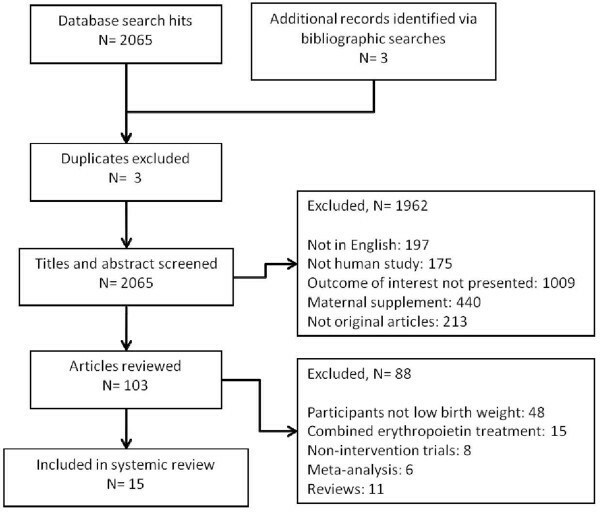 Hence, we performed a systematic review of the literature, focusing on the effects of iron supplementation in low birth weight / premature infants on hematologic iron status, growth, and neurodevelopment. We also examined potential adverse effects of iron supplementation. The Cochrane Library, Medline, and PubMed databases were searched from inception to June 2011. We limited the searches to include only articles written in English using the following terms: “preterm born infant(s) / children”; “preterm infants”; “prematurely born children” “weight less than 1500 g at birth”; “born prematurely”; “low birth weight infant(s)”; “infants born preterm”; “prematurity”; “small-for-gestational age”; “very small gestational age infants”; “iron supplementation”; “iron intake”; “iron supplements”; “ferric and/or ferrous compounds”; and “ferrous sulphate / fumarate / sulfate”. Boolean operators (not, and, or) were also used in succession to narrow and widen the search. To locate unpublished materials and avoid systemic bias, we manually searched the references lists of original and review articles for symposia proceedings, poster presentations, and abstract from major pediatric association meetings. Studies were eligible for inclusion if they involved infants who were of low birth weight (< 2500 g) or premature (gestational age < 35 weeks) and received iron supplementation through the enteral (formula or iron drops) or parenteral routes. Studies involving supplementation of other micronutrients were also eligible for inclusion if the only difference between the treatment and the control groups was iron supplementation. Studies were excluded if there was no definite length of treatment available, or if supplementation was combined erythropoietin treatment. The search and inclusion and exclusion criteria were developed by an investigative team, including experts in the field of pediatric development and nutrient research. Our team included a biostatistician who was instrumental in defining the criteria. The first step in study selection was the exclusion of duplicates (ie, reports of the same study). The title and abstract of the trials retrieved in the search were scanned and studies that were obviously irrelevant were excluded. The full text of each remaining study was reviewed to establish eligibility and all relevant information and data were extracted. Data were extracted by 3 independent reviewers. Each reviewer used a standardized data collection form to increase uniformity and reduce bias. In the case of discrepancy, the reviewers made a consensus decision. The following information / data were extracted from each eligible study: first author; year of publication; journal; eligibility criteria; definition of premature or low-birth weight; number of cases and control; population demographics; hematological data (hemoglobin, hematocrit, serum iron) before iron supplementation; iron supplement dose; duration of iron supplementation; hematological data after iron supplementation; growth status after iron supplementation; and adverse effects of iron supplementation. The quality of each study identified for inclusion was assessed using the Delphi list for quality assessment of randomized clinical trials . A total of 2065 articles were identified by searching the 3 databases and a further 3 articles were identified by bibliographic searches (Figure 1). Of these articles, 3 duplicates were subsequently excluded. Abstracts and titles for the remaining 2065 articles were reviewed and 1962 were subsequently excluded, typically because outcomes of interest were not presented or maternal supplements were given. Full text review led to exclusion of a further 88 articles. Hence, a total of 15 articles [2, 22–35] were included in the systematic review. The studies included in this systematic review were published between 1960 and 2010 and included low birth weight infants aged from birth to 80 days (Table 1). The number of low birth weight infants in the iron supplementation treatment group ranged from 16 to 90, with most studies having 20 to 40 infants per iron supplementation treatment group. Iron was most commonly given orally [2, 23, 27, 29–35] or as an iron-fortified formula [2, 24–26, 28]. In 1 study, iron was given by intramuscular injection . The duration of iron supplementation varied considerably, ranging from 1 week up to 18 months. AA, ascorbic acid; BW, birth weight; C, control; CAT, catalase; CGA, corrected gestational age; d, days; DHAA, dehydroascorbic acid; FRAG, red blood cell fragility; GA, gestational age; GDA, Griffiths’ Development Assessment; GHSPx, glutathione peroxidase; GGT, Gamma-glutamyl transferase; Hb, Hemoglobin; HCT, hematocrit; HTZ, height for age z score; MCH, mean corpuscular hemoglobin; MCHC, mean corpuscular hemoglobin concentration; ID, iron deficiency; IDA, iron deficiency anemia; MCV, mean corpuscular volume; MDA, malondialdehyde; mo, month; NA, not available; NCHC, normocytic hypochromic; NCNC, normocytic normochromic; PCV, packed cell volume; PLFE, plasma iron; PLCU, plasma copper; PLZN, plasma zinc; RBC, red blood cell; ROP, retinopathy of prematurity; SF, serum ferritin; SI, serum iron; SOD, superoxide dismutase; sTfR, soluble transferrin receptor; T, iron supplementation group; TAA, total ascorbic acid; TIBC, total iron binding capacity; TRN, transferrin; TRNSAT, transferrin saturation; wks, weeks; WTZ, weight for age z score; ZnPP/H, zinc protoporphyrin to heme ratio. a Age at the start of supplementation. b Data analysis sample size. The quality of studies included in the systematic review was generally acceptable for most items of quality assessment. The majority of studies employed a method of randomization (10/15; 66.7%), had similar between group characteristics at baseline (9/15; 60%), specified eligibility criteria (13/15; 86.7%), provided point estimates and measures of variability for the primary outcome measures (13/15; 86.7%), and included an intention-to-treat analysis (12/15; 80.0%). Only 6/15 (40%) studies provided any definitive information about blinding (outcome assessor, care provider, or patient) (Table 2). Was a method of randomization used? Were the groups similar at baseline regarding the most important prognostic indicators? Were the eligibility criteria specified? Was the care provider blinded? Were point estimates and measures of variability presented for the primary outcome measures? Did the analysis include an intention-to-treat analysis? N, no; NA, information not available or not applicable; Y, yes. Meta-analyses of the extracted data were not performed because mean values were not available or doses were not adjusted by body weight in the majority of the studies identified. There was significant heterogeneity (data not shown) among the 3 studies in which mean values were available and dose was adjusted for body weight [31, 34, 35]. All but 1 study reported on the effects of iron supplementation on hematologic measures of iron status (Table 3). The majority of studies reported that iron supplementation significantly increased hematologic measures of iron status relative to control. Specifically, Hammond et al. reported that premature infants treated for 2–4 days with intramuscular iron-dextran (100 mg) had significantly higher hemoglobin concentrations and hematocrit values from 3 months of age onwards and significantly higher erythrocyte counts from 5 months of age onwards compared with premature infants in the control group . In another study, Lundstrom et al. found that low birth weight infants treated for approximately 6 months with an oral iron supplement (2 mg/kg/day) had significantly higher hemoglobin, serum ferritin, mean corpuscular volume (MCV), and transferrin saturation levels at 3 months compared with low birth weight infants in the control group . Iwai et al. similarly reported that low birth weight infants fed an iron-fortified formula (8 mg/L) for 6 months had significantly higher hemoglobin, serum ferritin, and MCV concentrations than control infants fed human milk only . Aggarwal et al. also reported that low birth weight infants fed oral iron in a drop formulation (3 mg/kg/day) for 8 weeks had significantly higher adjusted (for age, hemoglobin, ferritin, and maternal hemoglobin) hemoglobin concentrations from 4 weeks onwards compared with control infants . Finally, Berglund et al. found that marginally low birth weight infants fed an oral iron supplement (1 or 2 mg/kg/day) between 6 weeks and 6 months of age had significantly higher hemoglobin, MCV, ferritin, transferrin, iron, transferrin saturation, and transferrin receptor levels compared with control infants . BW, birth weight; C, control; CGA, corrected gestational age; Hb, Hemoglobin; HCT, hematocrit; ID, iron deficiency; IDA, iron deficiency anemia; LBW, low birth weight; MCV, mean corpuscular volume; mo, month; ROP, retinopathy of prematurity; RBC, red blood cell; SF, serum ferritin; SI, serum iron; sTfR, soluble transferrin receptor; suppl., supplementation; T, iron supplementation group; TIBC, total iron binding capacity; TRN, transferrin; TRNSAT, transferrin saturation; wks, weeks; NA, not available. In a non-placebo controlled study, Arnon et al. found that premature infants fed enteral iron (5 mg/kg/day) from 2 weeks of age to 8 weeks of age had significantly higher hemoglobin, reticulocyte, iron, and ferritin concentrations compared with premature infants fed enteral iron (5 mg/kg/day) from 4 weeks of age to 8 weeks of age . In another non-placebo controlled study, Braekke et al. reported that very low birth weight infants given oral iron supplementation (9.4 mg/kg/day) from 6 weeks of age had significantly higher iron and transferrin saturation levels at 7 weeks of age . A small number of studies included in the systematic review found that iron supplementation had no significant effect on hematologic measures of iron status relative to control. These include studies by: Friel et al., in which low birth weight infants were fed either a normal (0.6-3.0 mg/kg/day) or high (0.6-5.9 mg/kg/day) iron formula from birth for 12 months ; Miller et al., in which 7 to 60 day-old premature infants were given oral iron (3 to 12 mg/kg/day) or control (no iron) for 3 weeks ; Sankar et al., in which very low birth weight infants were fed oral iron (3 to 4 mg/kg/day) or control (no iron) from 2 weeks of age until 60 days of age . A study by Griffin et al. compared the effects of formulations containing either 0.9 mg/dL iron or 0.5 mg/dL iron in premature infants and found that there were no dose-dependent differences in hematological indicators of iron status . In another study, Franz et al. reported that early iron supplementation (2 to 4 mg/kg/day once enteral feeding was tolerated) had no significant impact on indicators of iron status in infants with a birth weight <1301 g .
Most studies reported on the prevalence of iron deficiency (ID) and/or IDA (Table 3). All controlled studies that examined the prevalence of ID and/or IDA found that the prevalence of ID and/or IDA was lower in infants who received iron supplementation compared with infants who did not receive iron supplementation [2, 22, 24, 25, 35]. Several studies also reported dose-dependent effects of iron supplementation on the prevalence of ID and/or IDA, with higher iron doses being associated with decreased prevalence [25, 26, 35]. In contrast, Friel et al. found no obvious effect of dose, with 4/29 (13.8%) infants in the high iron supplementation group and 2/29 (6.9%) infants in the normal iron supplementation group having ID after 12 months of treatment . Franz et al. also found that iron supplementation was associated with a decreased prevalence of ID . Only 1 study found no obvious benefit of iron supplementation on the prevalence of ID and/or IDA. Brozovic et al. reported that oral iron (36.3 mg/day) from 5 weeks to 9 months of age did not prevent ID in premature low birth weight infants . Five studies included in the systematic review examined the effect of iron supplementation on growth, whereas only 2 studies examined the effect of iron supplementation on neurodevelopment (Table 4). None of the studies that examined growth-related variables, including growth rate, length, height, head circumference, and weight, found any effect of iron supplementation [25, 28, 29, 34, 35]. With regards to neurodevelopment, Friel et al. found that iron supplementation did not improve cognitive development as measured using Griffiths’ Development Assessment . In the other study, which focused on examining the effects of iron supplementation on neurocognitive development in premature infants weighing < 1301 g, Steinmacher et al. found that early supplementation (< 61 days of age) tended to improve neurocognitive and psychomotor development compared with late supplementation (≥ 61 days of age), as indicated by neurologic examination findings and Gross Motor Function Classification Scores . GDA, Griffiths’ Development Assessment; HTZ, height for age z score; suppl., supplement; WTZ, weight for age z score; NA, not available. Several studies included in the systematic review examined potential adverse effects of iron supplementation, including oxidative stress, inhibition of nutrient absorption, neonatal morbidity, the requirement for blood transfusion, and other adverse effects (Table 5). None of the studies found any evidence that iron supplementation increased oxidative stress in low birth weight infants [28, 30, 33]. The study conducted by Friel et al. was the only study to examine absorption of other nutrients with iron supplementation and found that both plasma zinc and copper concentrations were significantly higher for the group of infants who received high vs normal iron supplementation . Three of the 5 studies that reported on neonatal morbidity found no differences between the control and treatment groups or dose-dependent effects of iron supplementation on the overall incidence of morbidity [31, 34, 35]. The other 2 studies found that there was a tendency for there to be a higher prevalence of respiratory tract infection in the iron supplementation group compared with the control group  or the high compared with the normal iron supplementation group . Two out of 3 studies examining the need for blood transfusion found no effect of iron supplementation, [30, 34] whereas Arnon et al. reported that significantly more infants who started iron supplementation at 4 weeks of age required blood transfusions than infants who started iron supplementation at 2 weeks of age . Another adverse effect reported by Aggarwal et al. included mild vomiting (2/32 infants in the treatment group vs 0/30 infants in the control group) . C, control; CAT, catalase; GHSPx, glutathione peroxidase; MDA, malondialdehyde; PLCU, plasma copper; PLZN, plasma zinc; T, iron supplementation group; SOD, superoxide dismutase; NA, not available. This is the first systematic review to focus on the effects of iron supplementation in low birth weight / premature infants. Only a relatively small number (N = 15) of studies were identified for review. Several consistent findings were apparent with iron supplementation, including increased concentrations of hematologic indicators of iron status, decreased prevalence of ID / IDA, and a lack of an effect on growth parameters. Few studies that met the criteria for inclusion in our review reported on the effects of iron supplementation on neurodevelopment or the occurrence of adverse effects. Our observation that iron supplementation generally increased concentrations of hematologic indicators of iron status (notably hemoglobin, hematocrit, and serum ferritin) in low birth weight / premature infants is consistent with the findings of other systematic reviews / meta-analyses which examined the effects of iron supplementation on hematologic indicators of iron status in children  and young children . Unsurprisingly, given the improvements in iron status, there were corresponding decreases in the prevalence of ID/IDA among infants who received iron supplementation. Similar to our review, the findings of several systematic reviews / meta-analyses indicate that iron supplementation does not increase growth in children [18, 19]. We must emphasize, however, that both the studies included in our review and the previous systematic reviews / meta-analyses typically focused on assessing growth within the first 12 months of supplementation and did not assess longer term growth after iron supplementation. The longer term effect of iron supplementation on growth in low birth weight / premature infants remains to be determined. As low birth weight / premature infants are particularly vulnerable, and given the fact that humans have no physiologic mechanism for excreting iron, it is important to consider the possibility of iron overload with iron supplementation and identify any potential adverse effects of iron supplementation. Adverse effects of iron supplementation have been suggested, including oxidative stress  and an increased risk infection . None of the studies included in our review described any evidence of increased oxidative stress with iron supplementation; however, two studies reported an increased incidence of respiratory tract infection with iron supplementation. Given that iron (and other nutrients) can promote bacterial colonization, an increased risk of respiratory infection is a plausible potential adverse effect of iron supplementation. Further evidence is needed to confirm or deny this possibility. Overall, there were no consistent adverse effects of iron supplementation; however, not all studies monitored for adverse effects of iron supplementation and there was considerable between study variability in the types of adverse effects monitored / reported. Clearly, further studies are on needed on the potential adverse effects of iron supplementation in low birth weight / premature infants. This systematic review has a number of limitations that must be acknowledged. Perhaps the most important limitation is was the lack homogeneity between studies in terms of treatment dose, length of treatment, timing of treatment, age of the infants, length of follow-up, and variables assessed. These differences clearly make between study comparisons difficult and almost certainly explain some of the variability in findings. Another limitation is that the length of follow-up was relatively short for the assessment of growth and neurodevelopment. It is possible that any beneficial effects of iron supplementation on development may become apparent many years after supplementation has ceased. Indeed, in the only study with follow-up > 18 months, Steinmacher et al. found that more infants who received late vs early iron supplementation had abnormal neurologic examination findings at a median of 5.3 years of age . Although a method of randomization was used in most (10/15) studies included in our systematic review, the number of infants included in all studies was relatively small, thus reducing statistical power. Larger scale studies are clearly needed. With regards to the literature search process, we acknowledge the limitation of only considering English language articles for inclusion. In conclusion, our review leads us to suggest that iron supplementation can improve indicators of hematologic iron status and reduce the occurrence of ID / IDA in low birth weight / premature infants. The benefits of iron supplementation on growth appear to be limited, at least in the short term (within 18 months of treatment), whereas there is insufficient evidence on the effects of iron supplementation on neurodevelopment or the occurrence of adverse events in this population. Quite clearly larger scale, randomized controlled trials are needed to determine whether iron supplementation in low birth weight / premature infants affects neurodevelopment (short and long term) and long term growth, and to comprehensively monitor potential adverse effects. Such studies should also aim to determine if specific cohorts of low birth weight / premature infants are more likely to benefit from iron supplementation, and the optimal dose, timing, and duration of iron supplementation. Medical writing assistance was provided by MedCom Asia (Taipei, Taiwan). HL screened studies for inclusion, abstracted data, analyzed data, and drafted the manuscript. JY screened studies for inclusion, abstracted data, analyzed data, and drafted the manuscript. PH screened studies for inclusion, abstracted data, analyzed data, and helped to draft the manuscript. ZL verified outcomes data, assessed study quality, analyzed data, and helped to draft the manuscript. WQ, FW, and SZ critically revised the manuscript for important intellectual content. All authors read and approved the final published manuscript.